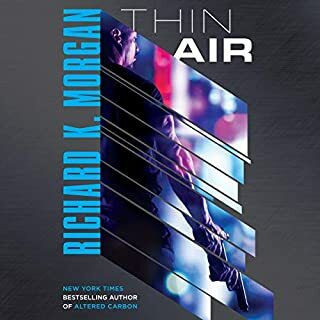 From the author of the award-winning Altered Carbon, which is now an exciting new series from Netflix. On a Mars where ruthless corporate interests violently collide with a homegrown independence movement as Earth-based overlords battle for profits and power, Hakan Veil is an ex-professional enforcer equipped with military-grade body tech that's made him a human killing machine. But he's had enough, and all he wants is a ticket back home - which is just what he's offered by the Earth Oversight organization, in exchange for being the bodyguard for an EO investigator. Morgan gets better and better! I absolutely loved this. Cyberpunk noir and a slippery plot with a splatter (hah!) of grimdark. Gory, conscious, postulating a plausible colonization outcome with no illusions about human nature and the agglomeration of capital, Thin Air will pull you in. I hope to hear more about the Overrider soon.